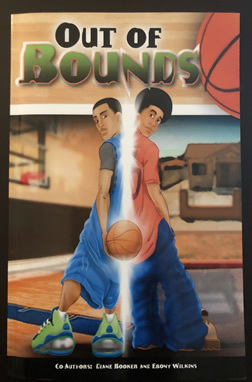 OUT OF BOUNDS by author and educator EBONY JOY WILKINS, Ph.D.
NBA star Arron Afflalo shares his principles of success in this fast-paced story of friendship, basketball and making tough decisions. Childhood best friends are pulled in separate directions for the first time. Arron and Nick used to do everything together around their Compton neighborhood, but mostly play ball. When Nick’s father is incarcerated and a new crowd of friends led Nick down a dangerous path, Arron has some tough choices to make – to stay loyal to Nick or stay on the path toward fulfilling his dream of playing in the NBA. Arron feels their friendship has gone out of bounds. Can the two boys stay friends and focus on their future dreams? All proceeds from the purchase of this book go to the U.S. Dream Academy to support after-school and mentoring programs. 1. Arron Afflalo has guidelines for success that he follows on and off of the basketball court. What are your guidelines for success? 2. Arron and Nick were lifelong best friends, but tough situations made them question their friendship. What would you do in their situation? How would you mend a broken friendship? 3. Arron’s dream was to make it to the NBA. What is your dream? What steps are you taking to reach your dreams? 4. If you had to leave a few friendships in order to reach your dream, what would you do? 5. Write your guidelines for success, share them with a friend, and ask them to share their guidelines with you. What are your friends’ guidelines for success?